It makes me happy to know I only have one more day in this school year to send my kids away with their lunch box. I think I’m speaking for most households when I say it often gets a little hectic trying to get everything ready in the morning so the kids can get off to school on time and have a healthy lunch too. In addition to that we are often getting ourselves ready for work and the list of things to do in the morning goes on. 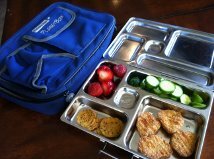 I can honestly say these Planetbox lunches have made it easier to prepare the lunches with no added containers and just a few separate compartments to neatly place all the food. Now is a good time of year to look into it as they are always busier of course in the fall. That way you can use the lunch boxes for summer picnics too. Hope this helps, I really enjoy this product!